Hoichoi wishes a very happy and prosperous Bengali New Year to all our friends. We have already started preparing for upcoming Durga Puja, which will be celebrated on 17th – 19th October 2018, and The special Bijoya Sammilani of Hoichoi would be celebrate on 20th October 2018. As usual, there would be cultural extravaganza, culinary delight, Dhunuchi Naach, Sindur Khela and lot more. Special attraction would be a professional play from Majlish, a melody evening from Moushmi Oberoi and last but not the least – a rocking performance from the India Idol superstar ‘AMIT SANA’! Hoichoi’s primary strength is YOU, and we need your active participation in arranging Hoichoi’s Grand Durga Puja this year. If you are interested to join hands with us to organize the event, please drop us a note at hoichoinl@gmail.com or contact us at 0684401050. We are waiting for you.. let’s do some Hoichoi together again! Far Corners B.V. – Our Travel and Tours Partner! 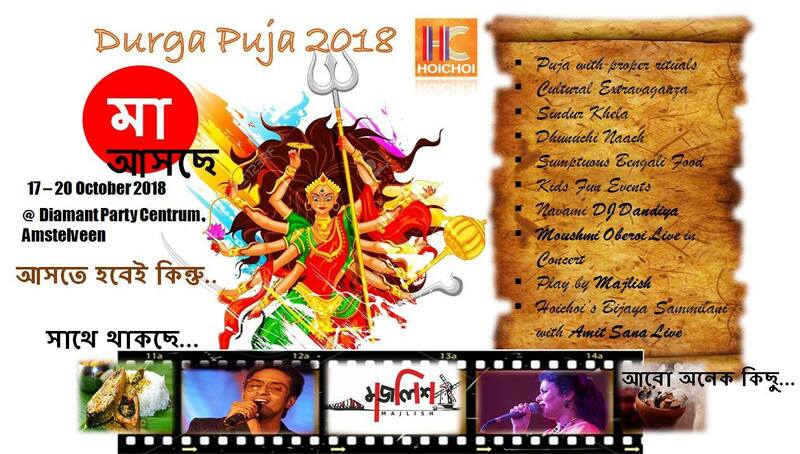 Be a part of our Durga Puja 2018 extravaganza!